Critical infrastructure security and operational technology leader. Over 14 years of experience managing international, complex OT and IoT security projects. Team and thought leader. Strategy former. Sustained low oil prices are driving adoption of digitalization across the oil and gas industry, ramping up the stakes for cybersecurity. Digital advancements, such as smart engineering technology (SET), the Industrial Internet of Things (IIoT) and big data, can bring both benefits and increased vulnerability to cyber threats. 1. Would you know if you were under attack right now? 2. What would you do if you were under attack? 3. How well do you know the scope of the IIoT/operational technology (OT) asset landscape you protect? 4. Is your business capable of running without IIoT/OT support? 5. How critical do you consider the IIoT environment in terms of business value creation? 6. What are the biggest cyber risks associated with your critical production environment? 7. How do you ensure security and resiliency in times of increased integration of data from multiple sources? 8. How well do you know the boundaries of the environment you need to protect? 9. Is configuration of your critical IIoT/OT devices safe (backup exists, tested, offsite storage is in place, etc.)? A mere 10%-20% of the oil and gas industry is digitized, and the pace of connected development is likely to significantly increase in the next decade. The IIoT and digital revolution offer great benefits to the oil and gas industry. However, they can increase exposure to new types of cybersecurity risks that require immediate attention. Our Global Information Security Survey (GISS) revealed that 57% of respondents in the oil and gas industry have had a recent significant cybersecurity incident. In a similar vein, a World Energy Council report published in September 2016 cited cybersecurity as a top issue for the energy industry, particularly in North America and Europe, where the infrastructure is most mature. OT environments have traditionally focused on ensuring high availability at the expense of confidentiality and integrity, and they are now very exposed to cybersecurity risks as a result of digitization and modernization, including connectivity to the internet. It is no longer practical or cost effective to maintain separate IT and OT environments. Indeed, to realize the maximum benefit from digitization and smart engineering, combining these environments is increasingly a necessity. These changes are being accelerated by the advent of new technologies such as IIoT and big data analytics. The convergence of the IT and OT environments has created new cyber-physical risks. New risks are being created where network connected endpoint devices such as unmanned vehicles[EM1] , smart sensors, handheld engineer terminals and industrial routing equipment are being produced and deployed without a cybersecurity baseline implementation and are open to remote compromise. As more and more devices are connected, the potential for infiltration rises exponentially. Today, cyber-physical risks are not being effectively identified, tracked or monitored — so how can such risks be appropriately mitigated? This, combined with the rate of new technology deployment and digitization of operational processes, means there is reason to act now. If cyber-physical systems are compromised, they could lead to a hazardous event, which could result in loss of critical national infrastructure services to the public or, worse, loss of life due to safety failings. Examples have already been seen with unmanned vehicles (such as drones and and driverless vehicles). Such attacks in the oil and gas industry can potentially go beyond damage to control systems, devices, equipment and the network. They can also pose risks to the entire supply chain and disrupt regional sector operations. This is the essence of cyber-physical risk. Oil and gas companies are in various stages of their digital transformation journeys, with many in the early stages. Understanding the current cyber-physical risk landscape and the threats that the IIoT and new technologies bring is critical for planning the long-term success of reliable and resilient sector operations. A clear understanding of the benefits to taking a proactive approach to security now, to avoid major vulnerabilities at a later stage, is critical. Such an approach would also mitigate the risks of digital transformation projects being delayed or experiencing major problems once launched. 1. Benchmark with similar companies on security spending. 2. Justify security spending by showing how much value is protected or even created out of ensuring cyber-resilient industrial operations. The more value we create out of connected cyber-physical systems, the more attention we should give to protecting them. Devices today are being deployed with inherent security flaws. 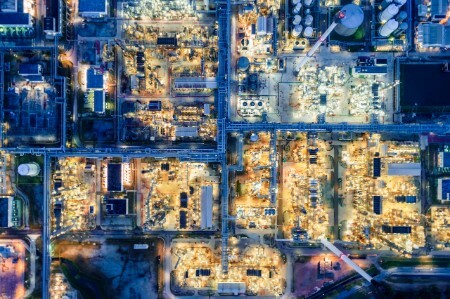 Ensuring a security baseline is in place before deployment will protect operations against endpoint IIoT threats and potential safety, reputational and economic impacts. Your risk footprint grows with every new connected field technology you implement, which can affect the safety and reliability of operations and staff. Our client interaction has revealed that many companies were unaware that cyber penetration testing was necessary, which is especially critical given the deeper connectivity between OT and IT systems. The lack of public reporting of cyber-attacks in the industry is yet another factor complicating the understanding of the size and true nature of various types of risks. The more you digitize, the more your cyber-risk footprint grows. Ensuring cyber is an active part of the digital design process will enable more technology to be implemented without adding additional operational risk. The US Department of Homeland Security says that oil and gas is the most attacked industrial sector. Aligning an organization’s digital strategy to address cyber-physical risks is necessary to appropriately protect operational assets and processes. An aligned digital and cyber strategy can enable digital transformation.